With their multitude of uses and ability to be both a striking centre-piece and covered shelter, Solardome® geodesic domes are ideal for the whole community to share. They represent an excellent focus for engaging people in community projects and collaborative working, and are something for the whole community to enjoy. They are also ideal as an innovative and flexible space for urban regeneration projects, and their design makes for an excellent, secure but welcoming, central socialising place. Urban agriculture is the practice of cultivating, processing, and distributing food in or around a village, town, or city, and is a great way of bring a community together. Urban agriculture can also involve animal husbandry, aquaculture, agroforestry, and horticulture. 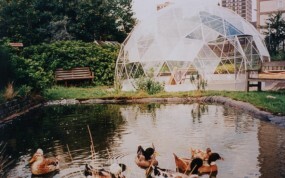 Why not use a Solardome® geodesic dome as a stunning centrepiece in your community? 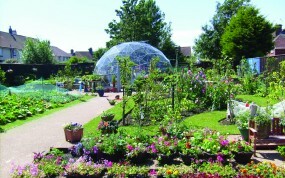 A dome can be constructed quickly and easily on an urban farm or an allotment. They are eco-friendly, efficient, long-lasting and low-maintenance, which means more time and money to concentrate on your community projects. Choose from our standard range of commercial glasshouse domes or our SOLARDOME® PRO system for habitable dome buildings from 10m – 25m diameter. At the heart of the Grange Park Estate in Blackpool lies an oasis of calm and beauty. 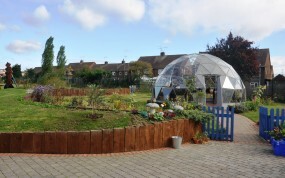 This previously neglected wasteland has been transformed into a community garden, featuring a SOLARDOME® Retreat. A SOLARDOME® Retreat is the focal point of a self-help project initiated by the tenants of a high rise block of flats in Salford, Manchester. “The Solardome team were excellent to work with right through from the initial enquiry through to the after service to ensure that we were completely informed and happy at all times. They gave realistic delivery and construction timescales which meant we could schedule in other work around this. Altogether our experience has been positive.